tattoo tuesday is back! been a while, eh? today we travel back over the pond to the isle of skye to check out a little body ink - a memorial tat on the arm of a very lovely lass named siobhan. siobhan was our server at the the charming and delicious harbour view seafood restaurant in portree. 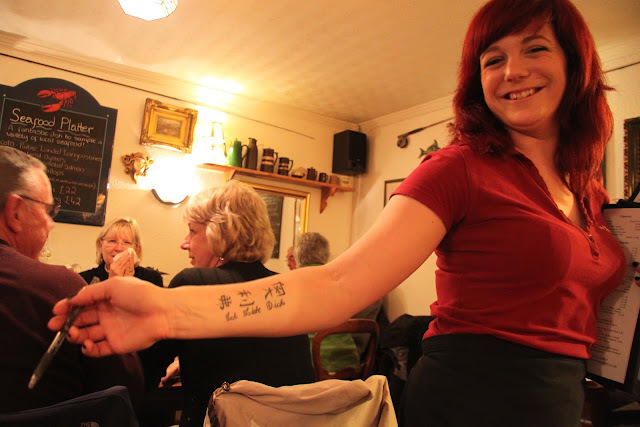 she shared a bit of the story which inspired the tat which is in memory of her boyfriend who died a few years back. it has been a couple months since we were there, so i can't remember all of details of the sad tale, but i recall his name was ollie and that there was a car involved in his death. Terrific portrait, as usual! I'm not sure I'd want such a sad reminder tattooed on my body.